Welcome to The Indian Rose! Here you will find articles and tutorials about Indian culture and lifestyle: from healthy natural remedies to Bollywood, from Ayurveda to South Asian fashion, plus celebrations, beauty, and more… A perfect blend of centuries-old Indian wisdom and modern desi lifestyle, with a stress on healthy and natural habits. The Indian Rose was created by Alice, an Italian in love with Indian culture. The editorial team is made up of Indian and non-Indian writers who share the common belief that South Asian culture is worth preserving and spreading. While The Indian Rose desi writers share their precious grandmothers´knowledge, non-Indian ones share their exciting Indian discoveries, and come up with original “India meets West” ideas. When it comes to food, beauty and natural remedies, The Indian Rose blends Indian traditions with modern healthy and natural lifestyle. Our “quick tutorials” section is filled with instructions for homemade products that are free of harmful chemicals. Check The Indian Rose regularly – or subscribe – for healthy lifestyle tips, beauty tutorials, homemade products’ recipes and all those things that make Indian life beautiful! If you like The Indian Rose, subscribe, and follow us on Facebook, Twitter, Google+ and Pinterest. The information, including but not limited to, text, graphics, images and other material contained on this website are for informational purposes only. 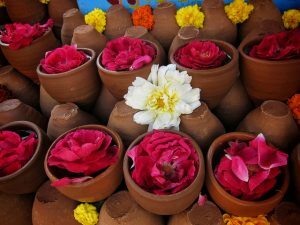 All information on theindianrose.com are based on the opinions of the authors and intended to stimulate opinion sharing. The authors of theindianrose.com are not health care providers and articles published on theindianrose.com do not substitute medical advice. Theindianrose.com strongly recommends you to seek professional medical advice before changing diet, taking medications, herbs, or try any health related recommendation found on theindianrose.com. Many of the links you will find on The Indian Rose are affiliate links, which means that we make a small commission for purchases made through our links. That is at no additional cost to you. Read our full affiliate disclosure.